Lens: 107mm f/12 (3 plastic elements). Shutter: electronic; range 1/4 - 1/180 sec. Autofocus, but not "Sonar"; only 2 focus zones. Nearest focus is 2 ft.
No manual focus control possible. Integrated automatic flash (cannot be overridden manually). Pictures are ejected into a transparent "storage chamber" in the back of the camera; to be removed at any time. Folding body is unlike the SX-70. Same as Captiva above, but with glass lens. by Master of Felix (Image rights). by Capt Kodak (Image rights). This was the world's first ever single-use instant camera. It was "disposable" but used Captiva 500 instant film. These are now rare, since used examples were disposed of. Lens: unknown (probably single-element plastic with a focal length of less than 100mm). Built-in electronic flash. (Switched on/off manually, but flash exposure appears to be automatic (quenched when correct exposure time is achieved). Flash/Daylight switch also changes the lens aperture via a simple stop. Manual print ejection via a pull-ring at the side of the camera. 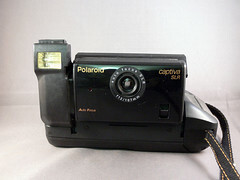 Camera was not intended for user reloading, but was packaged with a prepaid mailer (USA) for return to Polaroid for recycling. Customer was sent a refund coupon in exchange for the returned camera. European users were directed to return the camera to their local dealer, for which Polaroid would make a small contribution to a charity. Captiva and Popshots on the LandList. on www.collection-appareils.fr by Sylvain Halgand.